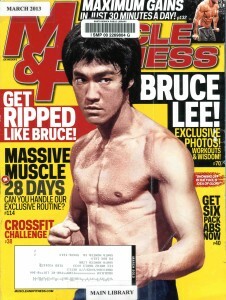 The March 2013 issue of Muscle & Fitness magazine caught my eye recently. That is because instead of the usual hypermuscled monstrosity of a human male on its cover, it was none other than Bruce Lee. But no one could argue that Lee’s physique was a model for a bodybuilding of another sort. He was chiseled and cut, lithe like a jungle cat. He trained for agility, speed, endurance, flexibility, explosive kicks and punches, decreased body fat, increased fast-twitch muscle fiber and a strength-to-weight ratio that allowed him to perform fingertip pushups. When it came to his training regimen, Bruce Lee wasn’t trying to be the Hulk (not that he could be; it wasn’t in his genetics) — what he achieved via his training was more like Spider-Man. So, Bruce Lee getting recognition in a magazine like Muscle & Fitness actually shows that its audience can be interested in more than just getting bulky when it comes to building muscle and gaining fitness. The article also points out that Lee was a pioneer in what is now called mixed martial arts or MMA. Once again, 40 years after his death, Bruce Lee is recognized for breaking barriers. Reading that article and thinking about Bruce Lee, of course, of course led to thinking about his son, Brandon Lee, who died 20 years ago March 31, 1993. He was 28. Wow. Twenty years. “It was just a month ago that I wrote in this space about renting and enjoying Lee’s ‘Rapid Fire,’ which at the time was an unexpectedly popular video rental. I had hoped the movie was a sign of bigger and better things to expect. Who could have foreseen the tragic end to this young man’s life? “When I returned home March 31, my answering machine was blinking with two messages from friends informing me of the bad news. It was unbelievable. ‘Is this some sort of perverse pre-April Fool’s Day joke to hype the movie?’ I thought to myself. I only wish it was. “As the news progressed, it was shocking to learn that doctors extracted an actual .44 caliber slug from his body. Some called it a ‘family curse.’ Ridiculous, of course, but the parallels between the deaths of Bruce Lee and Brandon Lee seemed ironic, to say the least. Both young, both dying under unusual circumstances with a movie under way. “It was a shame, because for a few short weeks, between the time Universal showed a sneak preview of ‘Dragon: The Bruce Lee Story’ and Brandon Lee’s death, it seemed as though closure to Bruce Lee’s legacy was made. The elder Lee’s loves, struggles and triumphs would be told to mass audiences and we could all move on, with Brandon Lee finally free to step out from his father’s shadow. The mood was not to last. 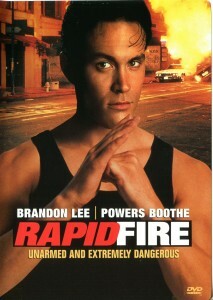 “ … I watched ‘Rapid Fire,’ which stars Brandon Lee and Powers Booth. I was disappointed by Lee’s previous outing, ‘Showdown in Little Tokyo.’ But I really enjoyed this one. The plot is better than most in the genre and the action scenes are quite clever. What Brandon Lee would have done, would have accomplished over the past 20 years is pure speculation. His trajectory was definitely upward; “The Crow” would likely have taken him to a new level, where he would have been respected for his acting, transcending the “son of Bruce Lee” tag that opened doors but also made him a curiosity. He probably would have co-starred in action movies with Jackie Chan and Jet Li, but would have also acted in purely dramatic roles alongside other actors who were renowned for their acting chops, not their fighting chops. Intead of Keanu Reeves in “The Matrix” movies, it might have been Brandon. I’d go so far to say that Brandon would have even tried his hand at comedy. You can sense that he had some comic ability, even from his limited filmography. Like Bruce, Brandon would not have put up with the usual Asian stereotypes that Hollywood was still putting out during his lifetime. I argue that had he not died, Bruce Lee would have upended so many of those stereotypes in the 1970s. Brandon’s presence would have done the same to advance the diversity of what Hollywood dished out with regard to Asians and Asian Americans, too. Were he still with us, Brandon undoubtedly would also have become a father by now. Depending on how old he was when that happened, he might have even co-starred in a couple pics with his kids. Alas, none of that happened. Brandon Lee, like his old man, left us too soon. We have his performances on DVDs and such, of course, and for that, we can be grateful. But I’m sure lots of folks — not just his former fiancée, his sister, Shannon and his mother, Linda — would rather have him with us. Regarding your quibble, where would you plot Bruce Lee’s breakout if not in 1973 with Enter the Dragon? Had Enter the Dragon not happened, some random Asian actor who happened to play a supporting role on a short-lived TV action series would be but a footnote to Asians in the media and martial arts. After 1973 Bruce Lee was an international star. Is this not right?